The main reason that doctors advise us to get our eyes examined every year is not to make sure that we will always have the perfect vision that a pilot has. Sure he will check for the most common eye diseases such as presbyopia, myopia, hyperopia, astigmatism, double vision, allergies e.t.c. But the eye is such a complicated and delicate organ that it actually functions as an early alarm for many diseases in their early stages. When a doctor examines your eyes, he does not just evaluate your vision for glasses and contact lenses. Have you ever wondered whyeye examsare taking more than just two minutes? It’s because the doctor is also checking thoroughly to see if there are any sign of eye diseases that could lead to vision loss and also for symptoms of many other serious conditions such as: High blood pressure, diabetes,Graves disease, Alzheimer and many other diseases which can be diagnosed very early with a simple eye exam. An early diagnosis of any disease can actually save our lives. From that perspective a walmart eye exam is not only very affordable but also it is the easiest way to make sure not only that your eyes are in perfect condition but also that your eyes who function as a mirror of your general health don’t reflect any problems from other health conditions. For young children, it is very important to have eye exams annually if not even more often. Their body is growing up and changing rapidly and the exact same thing happens to their eyes. Children are not able to report a vision problem to their parents because they don’t have the experience to actually realize what is happening to them. Very often children who have low performance at the school are children with an undetected vision problem. How do I know? Well to begin with I read about it but the truth is that it has happen to me. The three first years that I went to school I was among the best if not the best in my class. Then all of the sudden I was in hell. I had poor performance at school which I could not explain to my parents. And I felt so embarrassed. A few months later we found out that I had myopia, and I my parets were like: “oh that’s why he did not bother to copy what he had to do for homework from the blackboard” … With the lower fees that walmart eye exams offer you can afford to take your children for their eye exam as often as needed. 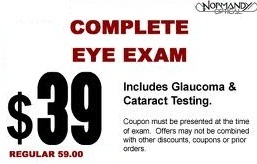 Walmart eye exam lower fees mean lower quality? According to walmart they provide: athorough exam with the most advanced diagnostic instruments to evaluate your vision needs and uncover any other ocular conditions that may go undetected.Their doctors have received their doctor’s degree after the same four years of training that all optometrists receive and they are licensed to practice by the state after extensive testing. They can offer lower fees because their overhead is lower operating there, and they are able to keep busy seeing patients all day because of their convenient location. The fee varies but you can visit walmarts eye exam pros website to find out exactly how much it costs in your location. But typically it will cost you around $50. Keep in mind that walmart does not outsource the construction of their glasses. They have their own optical labs and use their buying power to offer top quality glasses to a very low price. So if you go for a walmart eye exam and it turns out that you need a new pair of glasses, you will save even more because you won’t have to spend a fortune for your new glasses. And if you have an insurance to use, it will cost you even less, actually close to nothing.